So, this project was a bit personal. It was the house next door with a pretty rough past. When it became available for purchase we wanted to get our hands on it so that we could give the house the care it needed. We could see the potential for a home that wasn't very old in years, but had not been well-loved. It was time for its potential to shine and we were honored to do it. With a lot of love, sweat, and tears we brought this beauty new life for a new family. What a privilege to restore broken things! Out with the old and in with the new...plus an oversized multifunctional addition! This was quite the project and this was our starting point. These clients lived in one of the best locations in the city. They were not willing to give that up. The house had become very dated and was no longer meeting their needs. The wife is a pharmacist by day and a superhero baker by night. We still talk about her baking skills! The husband runs his own business from home. There was not enough space for all of the genius taking place in that house. The clients decided to gut and renovate 95% of the existing structure and add-on a new addition that would serve as the office space. The home-based business centered around the world of technology. That required the space to have few to no windows, especially facing the sun. This created a bit of a design challenge, but ultimately we were able to leave the homeowner with a space he loved. The new covered porch with double gabled front, brick and stone mix to add varying texture, and private side entry to the office leave this home feeling almost as special as its owners. The blank exterior wall that could not have windows (per the homeowner's request) was addressed with landscaping solutions that will grow into the part. A courtyard feel with wrought iron gate entry welcomes invited guests while maintaining a private feel. The existing home is now a brand new space. The homeowners requested sand and finish hardwood with an all white paint palette. The fireplace was removed with custom cabinetry installed in its place. The homeowners felt the fireplace was a wasted feature that took away function because it was never used. The openings were widened. Smooth ceilings were installed, and recessed cans were added throughout. The dining room was opened up for interior access to the new addition. The new adjoining office space can be made private with the double pocket doors tucked behind the custom built-ins. Notice the seamless transition from the existing home floor level into the new addition. We go to great lengths to calculate the new finished floor height from the footings up. This functional office space includes a kitchenette with a custom teak wood backsplash. Not pictured is a full size ADA bathroom with roll-in shower. The courtyard facing wall includes custom double depth built-ins with sliders allowing more storage and easy accessiblity for plenty of text books and manuals without taking up more wall space. We LOVED working on this home. We also miss the bags cookies and loaves of fresh baked bread! Heritage Homes & Designs is now a division of Noble Knights Construction Services, Inc. Together we are a full service construction company focusing our efforts across custom builds in new construction and renovation projects. We are so blessed to have won the President's Award again this year! This is something we have accomplished every year that we have opted to participate in the Home Builder's Show. What an honor! The award is for best booth design. We are so thankful for the love and support! Even under the NKCS, Inc. name we will continue to bring you the best! Want to know a secret? When we arrived for set-up we began the layout and construction. Then the flooring guys showed up to install a white and gray washed laminated hardwood floor....except it was REDISH BROWN. We made phone calls searching for answers and solutions with no luck. The bottom line was we had no access to any other options. We took a deep breath and Lori decided the best way to keep things calm and moving was to install what we had and paint it after the construction was finished. To feel confident it would last we used a porch floor paint in white. It turned out beautifully and made it through the show! Many thanks to Alan and Jonathan for staying overnight to paint and paint and paint. It made all the difference! Looking for customized home plans for your new construction dream build? We are here for you! The best part? If we build for you the cost of our drawings is 100% credited back to you! Are you in search of new cabinets for your home? Check out our Bertch cabinet line. We sell directly to you, the homeowner. No, you do not have to build with us to purchase from our line. We would love to work with you on your new cabinet order! We will be looking for you at the next Home Show! Sometimes we get so wrapped up in the scheduling and kick-off of a new project that we forget to take the before photos! It's the cardinal sin of renovation. Ugh! What a disappointment! BUT, we still have the after photos to enjoy. We will tell you that this one was a fun surprise. We don't often have a newer upscale home that is already beautifully finished, but just not in the client's style. That was the case for this gorgeous West Knoxville home. While the oversized stain finished semi-custom cabinetry was attractive, it just wasn't what the clients' loved. But don't fret, every item removed was salvaged and either sold or donated. We attempt to do this in all of our builds. For this home we did a complete kitchen and master bathroom gut and renovation. We adjusted the kitchen layout to create a better flow, moved the window upgrading it to a push-out, added wall sconces over the sink, created a wall of full cabinet storage, and installed an oversized island that would adjoin the kitchen table of their choosing. The goal was to create a specific color palette requested by the client and give a modern but transitional sense of style. These clients opted to keep and reuse the existing island lights. They also added a wine cooler and additional pantry space. These beautiful full-overlay flat panel door style cabinets are also from our in-house Bertch line. We chose to run the boxes to the ceiling with a glass front detail on the uppers. The floors remained the red oak sand and finish hardwood that was existing in the home. It required some work due to the change in layout. What a beautifully finished kitchen! The master bathroom was also a huge change from the stain finish cabinetry and darker granite, to the drop in tub with surrounding deck it once had. This bath also was divided with a private shower and toilet space in a separate part of the bathroom. The clients requested that we remove all dividing walls and design a new space with loads of style and without relocating any of the fixtures. We think it turned out to be one of our favorites! The free-standing tub with a custom tile detail floating above it is the centerpiece to this new bathroom retreat! The floor-mounted tub filler and wall sconce light fixture add the perfect touch of metal for the backdrop. The high-end tile detail is surrounded by a cost-friendly subway tile to finish the entire wall without draining the budget. The subway tile continues into the custom shower with well-designed niches, overhead rain shower, and frameless glass with exposed sliding hardware. The vanity space is finished with semi-recessed sinks, wall-mounted faucets, bevel framed mirrors, and a reduced height vanity space dividing the sinks for the beautiful and petite homeowner to sit while getting ready. The top-down, bottom-up shade offers both privacy and sunlight in the space. We hope you love it as much as we do! After spending many years in their home raising a family, husband and wife, Angie and Jeff, found themselves looking into a home that carried the special memories of years gone by, but dragging the style of those years with it. Angie especially loved the home and the location, but began considering a new home purchase. She dreamed of new finishes, a more functional kitchen, updated colors, a master bath that felt more like a retreat, and a living room that welcomed her home at the end of each day. After much consideration, Angie and Jeff decided they loved their home too much to wave goodbye in order to enjoy an updated lifestyle. This began a search for the perfect design plan to help them fall in love with their home once more. Many clients are seeking function or a particular style, but our goal throughout this project was to help Angie and Jeff simply love living in their space again. The kitchen is what we see in a typical build from a few decades ago. It is accented with fluorescent overhead lighting, 12x12 ceramic tile with dark grout, and white raised panel laminate cabinets. This kitchen also lost a lot of space from an oversized framed corner pantry and raised bar-height knee wall. Although there are multiple openings to the kitchen, it felt quite closed off from the rest of the house. Additionally, the homeowners hoped to create a feel of openness which seemed to be a challenge in a kitchen with an odd layout. The corner sink and reduced counterspace interfered with function. 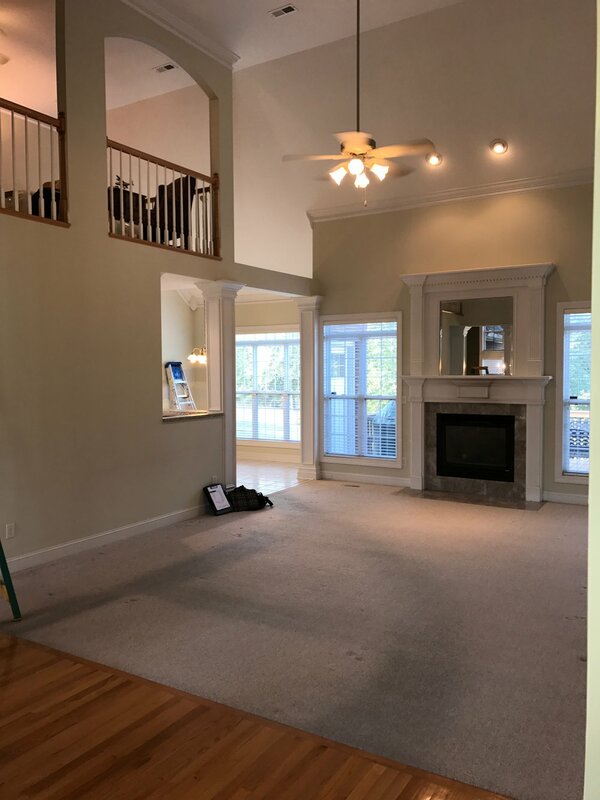 The living room and dining room met one another with competing flooring, and the fireplace is seen here not living up to its potential. Once again, a traditionally framed closet reduces the usable space in the master bath. Angie and Jeff were patient and flexible as the project took shape and more ideas were introduced in order to maximize space and create the overall style. They determined mid-project that it was worth the cost to tackle the removal of the prison-like columns that welcomed guests into the dining room (and tried to keep them there). The number and size of the columns was just too much for the space. These gorgeous icy blue/gray Bertch cabinets perfectly compliment Angie's style. 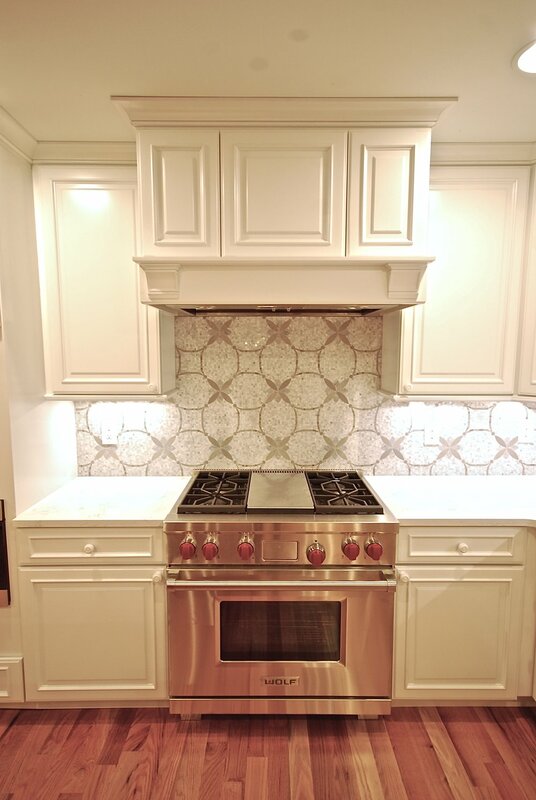 She selected a beautiful quartz that reflects the look of classic marble for both the countertops and the backsplash. 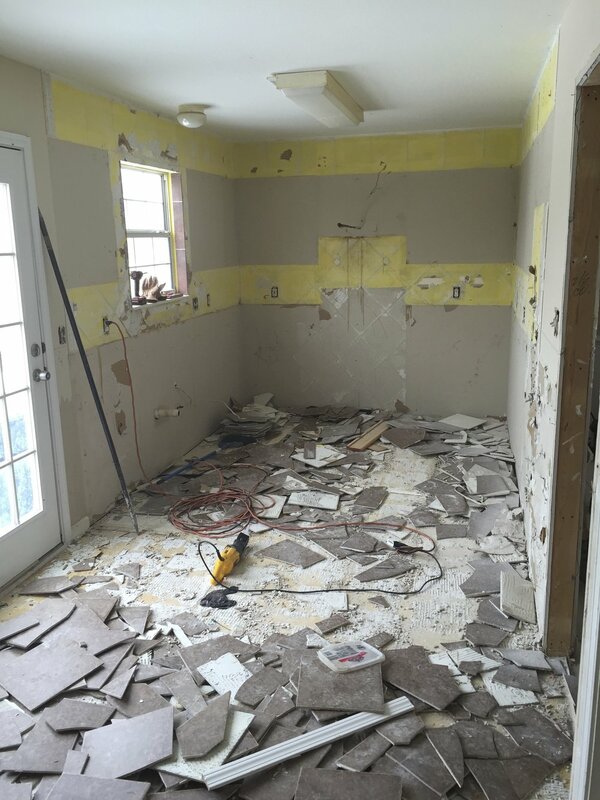 The framed pantry was removed along with the wall that divided the back hallway from the kitchen. This allowed us to expand the cabinet run a significant amount creating a good area of work space on the range side of the kitchen. The range is made functional with a pot filler and some flavor was added to this wall with a custom fabricated stainless hood and stylish glass front cabinets with decorative mullions. Angie was obsessed with the bird cage style light fixture and selected it to finish off the space with both fun and elegance. Instead of having the visual interuption of the dividing wall between the fridge and the back hallway, this kitchen is finished out with cabinet panels. We opted for a counterdepth refrigerator in order to keep the kitchen looking and feeling spacious. Unless a client refuses, we try to move to counter depth in every build. The sink was relocated to the passthrough wall and includes a casual but beautiful apron front detail with a bridge faucet. The passthrough was widened for a true open feel to the living room and the knee wall was removed with the countertop extended for more useable space. We also determined that it would be best to integrate a microwave drawer under the counter for both function and style. This allows countertops to be freed up, cabinets do not have to be ordered as a large unit, and the space over the range can be utilized as a focal point worth viewing. What a facelift! Handscrape wide-planked hardwood was selected by the client. They also decided on a casual and rustic stone for the fireplace with a reclaimed beam used as the mantel. With the wider passthrough behind the sofa and classic gray wall color, this space feels luxurious, open, and inviting. The dining room is now complete with one full column and two half columns (one at each wall). A trim detail on the focal wall is finished with a darker gray paint color that compliments the client's existing dining furnishings. Lastly, we are left with a love for this wood/metal mix light fixture! 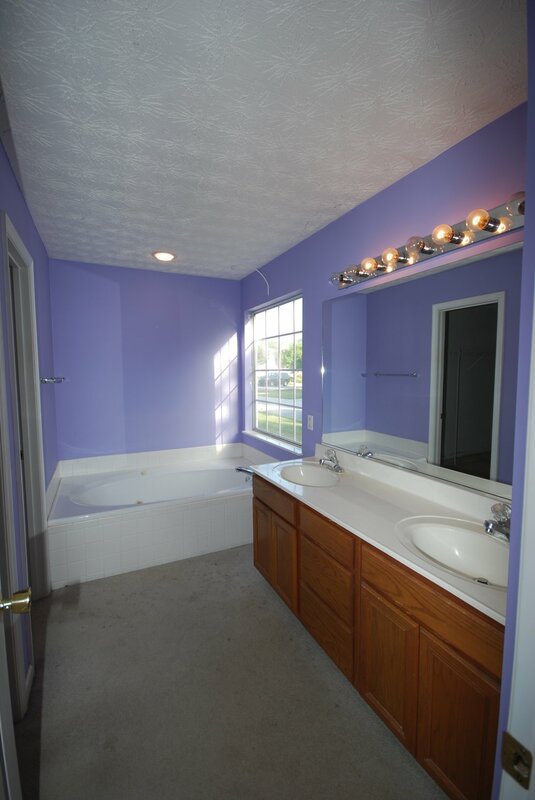 READY TO SEE THAT MASTER BATH?? Where do we start? They wanted a retreat and we believe they've got one! After walking another project we were wrapping up, Angie fell in love with the herringbone porcelain floor tiles we used there. Those are paired here with Bertch cabinets designed with an offset, drawer stack, and a linen tower. This eliminated the need for a bulky framed linen closet. We also upgraded the closet system in the oversized master closet (located in the bathroom) to help with additional linen needs. For a luxurious finish we opted to install wall mount faucets with semi-recessed sinks and a gorgeous marble and mosaic tile backsplash. Wall sconces with mirrors that have an interesting flair complete the dual sink area. The rest of the update comes with a freestanding tub, custom tile shower, and frameless glass. Other areas of the home were renovated as well, giving a big impact in small spaces such as the powder room, laundry room, bedrooms, and this small hall bathroom. What a blessing to work with such a loving and thoughtful couple. We thoroughly enjoyed transforming this home. Angie and Jeff have fallen in love with their home again and we couldn't be more excited for them! Even the smallest of kitchens can work well when the design plan is arranged with every inch of space and function in mind. This undersized kitchen was not working for the homeowners. The original kitchen was losing an opportunity for cabinet and counter space, having two entry points into the already small area. The oven stack located next to the entry door gave a feeling of being closed in, and did not allow a quick and easy spot to drop groceries and goods upon entering. We also saw an immediate alternative to the exposed stairwell line at the ceiling towards the back of the room that left this space lacking a luxury feel. A beautiful family with a stay-at-home father and cook, this Dad wanted to enjoy his time preparing meals. We designed a new layout with just enough change to provide ease. Removing one access point into the kitchen and bringing the cabinet run around into a U-shape gave the prep space and cabinet space he was looking for. Moving the oven stack to the opposite side offered a more open feel and allowed the new chimney style hood to be a clean and modern focal point. We also created a cased opening at the back of the room with a butler's pantry. This was the perfect location between the kitchen and formal dining room that worked to bring in a luxury element and mask the stair line that was once exposed. The clients selected the floors, cabinets, and countertops to match their own personal style. What a transformation! These homeowners never planned to be in their newly built home for long. Ten years later they found themselves wishing they had spent more time personalizing their interior selections and making the space fit their family's needs. A new kitchen layout allows for the opportunity of natural light by adding a wall of windows and a welcoming attitude. The once under-utilized breakfast nook is now the much loved family hangout. Swapping the keeping room with the breakfast area has allowed proper scale according to the way the family functions daily. A trifold glass wall system brings the outdoors in and allows the homeowners to enjoy the natural light they were once lacking. A new living room design plan offers a beautiful and functional gathering place for this family of five. From the living room we get to take advantage of the view to the vibrant new sunroom addition. In these videos, we talk about some of the materials we use in our building projects.